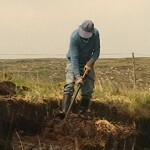 Seán Le Sleán, the award winning documentary (Tuam 2008) on traditional turf cutting, by our very own Seán Breathnach, is to be shown at the Seachtain Na Gaeilge film fest – which is being shown in venues both nationwide, in London and New York. Seán Le Sleán tells the story of one of the last men to perform the art of Turf cutting. It demonstrates an art that is truly almost lost forever. What was once a field covered with men digging for turf has become a place of silence and solitude.